Our Venturing Through Vermont Road Trip found us heading south, through the state, with destinations of Arlington, Manchester, and Bennington in mind. 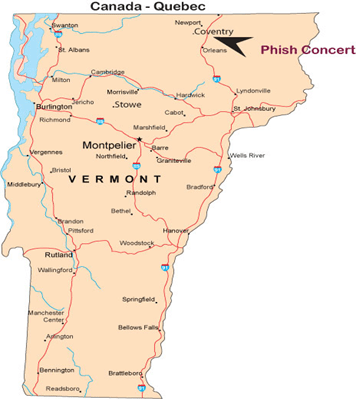 We set out on Highway 89, then east at highway 107 through the Green Mountain National Forest and then followed Highway 7 south along the east side of the forest – again marveling at the many shades of green and the beauty of the forests and mountains of Vermont. The National Forest stretches across much of the length of the state. Encompassing 420,000 acres, it is a year-round destination featuring 900 miles of biking trails, 400 miles of snowmobile trails, seven cross-country, and three downhill ski areas. As we headed towards Bennington County, we came to an abrupt stop at the sight of a Kissing Bridge, wrought-iron benches, and sets of swing chairs spread around a quaint building, The Vermont Country Store. We spent about thirty minutes browsing around the great variety of goods on display inside before driving on to Manchester and then Arlington. Route 7A runs through the small village of Arlington and one cannot miss the huge signs to the Sugar Shack housing the Norman Rockwell Museum. We were looking forward to this visit since a friend from Charleston had sat as a model for Norman Rockwell while living in New York. The Sugar Shack is an unpretentious little building and the Museum is only one large room, but it did not disappoint. There is an excellent introductory video about his life and work and the works on display are chronologically and thematically categorized, giving one an excellent overview of the times he lived in, his life and philosophy and how his art progressed through the years, A visit to this exhibit is highly recommended. The village is very proud of his heritage and by arrangement, locals will come in to talk to groups of visitors. We saw some great-looking restaurants while driving through Manchester, so we back-peddled and stopped at Mulligans of Manchester Restaurant and Pub, situated in one of the lovely houses on the tree-lined main road through town. We enjoyed the local atmosphere and scrumptious home-grilled hamburgers, fresh salad and a glass of good wine. Then, it was back to Arlington to book into the historic Ira Allen House built in 1779, one of the oldest bed and breakfast inns in Vermont where both the Ira and Ethan Allen families once lived and the Green Mountain Boys used to meet. Elsa was playing a few notes on the piano when one of the two charming hosts came running down the stairs, pulled out some piano duets and in no time, the two of them had a great time tickling the ivories together. Before settling in, we spent some time exploring this fascinating Inn with all its unusual nooks and crannies and bedrooms, each uniquely reconstructed and furnished. After a gourmet breakfast prepared with fresh local products, we headed into the town of Manchester. The town is composed of three communities: Manchester, Manchester Center, and Manchester Depot. Each has its own characteristics. Manchester has marble sidewalks, rows of elm-lined streets, and a monument to Revolutionary War Heroes while Manchester Center is a retail area with many stores and restaurants. We stopped for a coffee at the Little Rooster Cafe and there were told: “People come here to go to the bookstore”. So off we headed to check out the destination Northshire Bookstore in the heart of town. This impressive bookstore has numerous floors to explore, thousands of books, new and second-hand, toys, puzzles and stationery, an adjoining Spiral Press Cafe, and is certainly worth a visit. Our innkeeper had told us that “This is where the Green Mountain Boys roamed” and we picked up the trail at The Equinox Golf Resort and Spa, situated on Route 7A at the foot of Mount Equinox. The Marsh Tavern, one of the five restaurants on the property, was once confiscated to help finance a regiment of the ‘Green Mountain Boys’. The Equinox, a carefully restored designated national historic place dating back to 1769, offers five different types of luxury accommodation, a spa, and golf club, and is a popular wedding destination. We discovered that The Equinox had hosted four different presidents and one vice-president during its time. Abraham Lincoln’s wife and son, Robert, were frequent visitors. In fact, Robert so loved the area that in 1905, he purchased the nearby Hildene Farm and built the ancestral home. Hildene, the Lincoln Family Home, was thus our next stop. The 412-acre estate is considered to be the most important Lincoln site outside Illinois. It is a huge complex, comprising of the Welcome Center/Museum Store, 24-room Georgian Revival Mansion, Formal Gardens, “Sunbeam” (the Pullman, Goat Dairy, and the Dene Farm. We learned about the history through two videos at the Welcome Center. The first focused on the history of the Lincolns in Vermont, the second detailed the restoration of the 1903 wooden Pullman Palace Car. Hildene was constructed by Robert, Lincoln’s only child to survive into adulthood. Construction began in 1905 and descendants lived there for the next 70 years. The 24-room Georgian Revival Mansion, along with beautiful period furniture, also houses an exhibit which displays Lincoln artifacts, including one of only three remaining original Lincoln top hats. From the 2nd floor, one can view the Formal Garden as well as enticing views of Mt. Equinox and the Green Mountains. When Robert built Hildene, he was president of the Pullman Car Company. Not only is the Pullman Car a gem in its own right, it also houses an exhibit titled “Many Voices’. The exhibit depicts 100 years of social history, 1863 – 1963, through voices of the wealthy, the Pullman Porters, and current guests. This exhibit elevated Hildene to recognition on the Vermont African American Heritage Trail. We took advantage of the shuttle to hop on/hop off around the site. Our driver, Bruce, stated: “I love it here at Hildene! It is growing all the time”. We learned the Board of Directors works diligently to transform Lincoln’s values into 21st-century actions. The entire afternoon was a learning experience and a delight! Instead of dinner out, we enjoyed the local Italian sausage and artisan cheeses we bought at Fortunas Market in Manchester. We followed the VT-7 S to Bennington where we stopped at the Bennington Museum which houses the largest public collection of “Grandma Moses” paintings, memorabilia, and photos. Anna Mary Robertson Moses had no formal art training and began painting at the age of 78. She painted scenes of rural American life as she remembered it in the days gone by. In 1940, MOMA held an exhibit of Unknown American Painters and this was where she was discovered. Her popularity rose and she became known as “Grandma Moses” loved for her Folk Art Style. She passed away in 1961. Adjacent to the Grandma Moses exhibit is an informative display of the Battle of Vermont fought on August 16, 1777. After minor skirmishes and big losses on both sides, the final battle defeating the British took place at Bennington. Seth Warner, leader of the Green Mountain Boys who came in as reinforcement from Manchester, exhorted the tired troops to fight and subsequently achieve victory. Our ventures in Vermont over, we headed east on highway 9, once again traversing the Green Mountain National Forest. The destination being Maine, we were “mainly” looking for delicious lobster! We discovered a bustling city and quaint villages.